This Indiegogo project has delighted Mac evangelists. It's been 20 years since Apple launched the first in its series of game-changing personal computers. Instantly recognisable thanks to its unique shape and brightly coloured, translucent monitors, the iMac G3 provided Apple with a much-needed shot in the arm. 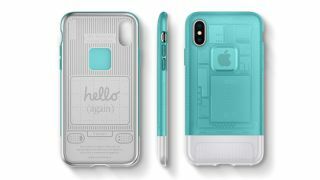 To celebrate the anniversary, phone accessory manufacturer Spigen is bringing the design of the iMac G3 to the iPhone X with a series of fun cases. Unveiled through a suitably charismatic presentation by Steve Jobs on May 8 1998, the iMac G3 would go on to set itself apart from the pack with a range of colour options including Bondi Blue, Blue Dalmatian and Flower Power. Sir Jonathan Ive, the man behind the look of the iPod, is credited with creating the groundbreaking industrial design. Jobs summed it up best when he said "it looks like it's from another planet. A good planet. A planet with better designers." Spigen has proved that there's still a strong market for brightly coloured tech packed with turn-of-the-millennium appeal as its iPhone X Indiegogo campaign has already smashed its target. The manufacturer's Classic C1 phone cases are described as 'familiar but extraordinary'. Tapping into the nostalgia of people who grew up with the original iMac G3, these clever cases shrink down the desktop's design elements into something that you can carry around in your pocket. "We took the chance to deepen what we already knew of the iconic computer," says Spigen on its fundraiser page. "We personally bought, cleaned up and re-examined every part of the classic computer to bring it back for devices of today." With a month to go until Spigen's Indiegogo pledge comes to an end, there's still plenty of time to snap up one of these cases for as little as $25. And with this phenomenally popular project having already sailed past its goal by 1139%, you don't even have to worry that your pledge will go unrewarded.